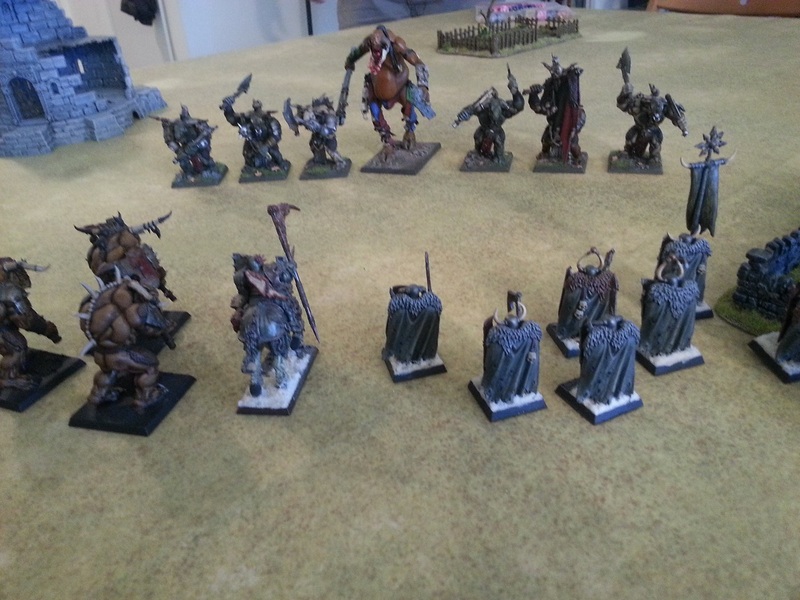 Here's a report on a rather insane big six player 9th Age siege game we've just played over the past two days. It was 36,000 points or something close to it. I took 3000 points of Beastmen and 3000 of Daemons, allied with Rhy's 6000 of Warriors of Chaos, and there were 8000 points of opportunistic Orks and Goblins involved commanded by Mike. I think the Orks were on our side, but I'm not sure as they only seemed concerned about looting a Dwarven brewery rather than storming the castle we were aiming for. Defending were Alan's Empire in the castle, and Alex's Dwarves and Dylan's Ogres near the brewery. Kudos to Alex who pulled the whole thing together and also provided the following background story! The township of Langwald lies to the East of the province and is important enough to be fortified. Indeed, the cult of Sigmar has built a shrine to bring the light of the God-Emperor to these dark places. Quite a few pilgrims come to Langwald to ask Sigmar for protection and guidance. Lately, a flow of refugees from Ostermark has alerted the town of a ravaging Chaos horde led by Perrin the All-Seeing. In fact, the Chaos Lord has been gifted quite a few extra eyes by his patron deity Tzeentch. His horde has been rampaging through most of Ostermark and is now heading for Langwald. Major Conrad Seussenhoffer is in charge of the city defence and should make sure that Sigmar’s heirs prevail in the coming battle. Lector Hans Rudel, the head of the local Sigmarites, has made sure to use his influence and gold to send for reinforcements, for the town shrine actually contains a holy relic that cannot fall into the hands of Chaos! That is why Grand Master Rudolf Hetz has been sent to gather help to defeat the Chaos horde. The real question is: what help will he be able to find and will he make it back in time to save the city? Langwald is actually bordering the end of the Great Forest and so has to deal with beastmen warbands rampaging through the area on a regular basis. In the months preceding the siege, Borok the Boobyfier, the most powerful Beastlord of the Jagerforst forest, has been foretold by his shamans of the coming of a mighty lord of Chaos. It was prophesized by the shamans that joining forces with such a conqueror would bring the attention of the Chaos gods on Borok and the herd. On the other side of the Haunted Hills, to the east of Langwald, a mighty Dwarfs Throng, accompanied by a contingent of Ogres mercenaries, has settle camp. They are a diplomatic delegation from Zhufbar heading to Karak Norn to settle some old grudges (usual Dwarfs business). But their rangers have reported the approaching Chaos horde heading for Langwald. The empire town is indeed under Sigmar’s protection (and lucky) that its founders have helped Dwarfs from Zhufbar during the Vampire Wars. As the Dwarfs do keep record of everything, it has been established that this debt had not been repaid yet. The lord leading the Dwarfs throng, Gromtig Copperbeard, has decided that the debt should be repaid before carrying on their diplomatic mission to Karak Norn. Befat the Magnificient, leader of the Ogres mercenaries, has accepted to help the Dwarfs beyond the original contract, politely asking for an extra chest of gemstones for his troubles of course. His tribe, the Fine Feasters, are quite excited by the prospect of fighting Chaos warriors, for they are quite fond of the Northerners’ flesh. They think it tastes quite exotic, as opposed to the bland and boring taste of men from the Empire or Bretonnia, the sour taste of Elven flesh or the floury taste of Dwarven meat. Little do the Dwarfs and Ogres know that they were being watched by enemy spies belonging to an old nemesis: the Greenskins. Ezza Ozzog, Warlord of the Mutherkrusherz tribe, has been foretold by his shaman, Gorgash Stuntysmasha, that Gork (or possibly Mork) have big planz for him! A big mighty klash awaits him and will prove decisive for him to assure his Godz that he’s the smashiest Orc Warlord around! What Ezza did not realise was that his shaman has been intoxicated by shrooms… Indeed, Goblin King Snorko Bogroft has made sure his shamans are actually playing a game of puppets with Ezza’s closest advisors… a game of puppets involving shrooms… lots of shrooms!!! Snorko’s tribe, the Grot Scrubberz, have joined Ezza’s Whaaagh since its inception, which was instrumented by Snorko himself in true Goblin fashion (from the back). Now, all the forces are converging toward their target. The Chaos and Beastmen horde are marching towards the city they want to defile in the name of the Dark Gods. The Dwarfs and Ogres are rushing to help their old allies (or clients depending who you ask…). The Orcs and Goblins are preparing to ambush the hated stunties and their bigger allies. Finally, the defenders of Langwald are desperately looking to the West in the hope that a relief force led by Rudolf Hetz will suddenly appear to vanquish the Chaos forces… Only time will tell what the outcome of such a mighty clash of armies will be. One thing’s for sure: victory will come at a price which can only be paid with blood! Here's a picture of my forces before the battle. Daemons on the left, Beastmen on the right. Beastmen were assaulting, with the two giants and some infantry ambushing. The Daemons would appear once enough casualties had been caused to summon them. This will be bit of an overview and highlights rather than detailed, as there was too much happening for one person to keep track of it all of course! Here's a view down the table. Castle on the left, attackers on the right. In the back is the Dwarven brewery which can be seen better in another couple of photos. The Dwarven Brewery with Dwarves and Ogres defending. 8000 points of Orks and Goblins surrounding them on three sides. My Beastmen ready to assault the castle. Another view of the Greenskins. We start pushing our towers towards the walls. My Beastlord on his throne shouting instructions ("Left a bit, no right a bit!"). And Shaman casting spells from the next one. Don't know why the pigs are up there. My Ungors capture and desecrate the Church by pooping on the altar. First victory condition achieved! Empire start shooting at the towers but without much success. My first ambushing giant arrives, having climbed over the walls from a different direction. (An earlier joke had them disguising themselves as washer women to achieve surprise, hence the dress it is wearing... yeah I know I'm not well). The Giant aims for the Steam Tank. Flagellants furious at desecration of their church retake it from the Ungors. The Jabberwocky thinks about intervening, but decides they look a bit too angry and thinks better of it. One of the siege towers is destroyed by Empire Artillery. Things start to get messy near the brewery. An Empire relief force arrives on my flank consisting of Dogs of War mercenaries. Other end of the Empire Castle. My Bestigors arrive and storm the ramparts! With aid of my Jaberwocky's Aura of Madness lowering the Empire Leadership, the Bestigors capture the first wall. The Empire are holding off my other assault though. The Chaos warriors are assaulting another wall but haven't breached it. Day 2. Another giant enters from behind the enemy walls, as do some Ungors out of the sewers. The newly arriving giant is shot dead by Empire Artillery immediately. The other Giant alternates between missing the Steam Tank with his Thump attack and yelling at it stupidly. The Dwarves and Ogres have beaten up the wings of the Greenskin attack but there are plenty more coming. Beast and Chaos forces move to meet the Empire relief force. The Chariots plunge into the mercenaries. The Daemons are also appearing, drawn by the carnage. Bestigors break into the courtyard, but then take many casualties from Empire missile troops in the surrounding towers. My Ungors move up onto the Battlements the Bestigors had vacated, but are then driven from them by Empire rangers entering from outside through the Siege Tower we had carelessly left there... oops. Some Daemons appear in the courtyard too, and Trolls break through the gate. Greatswords stubbornly hold them both off. Bestigors attack the Steam Tank to help the Giant out. Don't really know what was happening at other end of table. Dwarves and Orks hating each other I guess. Many Ork units are looking very unhealthy. In the back that looks like Goblin whirling ball and chain fanatics have gone through their own Ork unit. Wouldn't surprise me knowing Mike. Jabberwocky has skillfully avoided enemy all game, but is now trapped and charged by angry Flagellants and dies. Very sad. And the Steam Tank dies as the Giant lands a solid Thump attack at last. The Giant only has a single wound left out of six. At this point we called the game after six turns. I think the game was something of a messy loss to the attackers, as the Chaos had not managed to capture two thirds of the Castle in time, nor the Brewery. At least my Ungors managed to poop in the church. Anyway a good way to spend a weekend, with much merriment and beer drunk. Thanks to all the players and especially to Alex for organising it all! The battle was bloody on and within the walls of Langwald. Casualties on both sides were horrendous, much to the pleasure of the Blood God who does not care from where the blood flows. And flowing it was! The relief forces, led by the returning Grand Master Hetz, arrived in time to participate to the bloody conflict and consisted of mercenaries, Dogs of War as they are often referred to. However, the Chaos forces had dark plans to gather allies of their own… And so it was that attracted by the bloodshed and violence, Daemons started to materialise on the battlefield, even within the town itself. No doubt, some agents of the Dark Gods were at work before the siege and made sure that the walls would fall from within if not from the assault of the Chaos horde. It was with horror that Lector Rudel watched the foul creatures appear within his own ranks, defiling the sacred relic that was his duty to protect. On the walls of Langwald, the assault from the Chaos forces was still putting a lot of pressure on the defenders. Most walls had fallen to enemy hands but the few that still belonged to the Empire troops were defended fiercely. And in the end, the determination of the men of the Empire was their salvation. The Chaos forces started to withdraw. A few beastmen at first, then the whole herd was called back by Borok. What was left of the Chaos host quickly followed their beast allies. No one in the Empire ranks could understand why the Chaos forces were withdrawing that close to victory. Maybe it was the fierce determination with which the men defending had fought or maybe the relief force was too much for them. However, no one was really in a mood for celebration for this was not close enough to victory. The daemons were still running rampage through the town and needed to be dealt with. Also, everyone could hear the laughter of the Dark Gods in their heads. Such was the carnage left after the battle that it would take a long time for the town to recover, if that was going to happen at all. Everything outside the walls had been destroyed or defiled by the unholy. It would be with heavy hearts and sorrow that men would start to rebuild and clean, if the scions of the Dark Gods did not come back to haunt them later on. The Dwarfs and Ogres were preparing to sell their life dearly to defend the brewery. But suddenly, a withdrawal signal (if a high pitched noise similar to a goblin being butchered could be named as such) sounded and what was left of Ezza’s host turned around and disappeared in the thick forests from where it had come. Unknown to the Dwarfs and their allies, Ezza had finally noticed the absence of his goblin “ally”, Snorko. Indeed, it occurred to Ezza that Snorko had not been seen at all during the battle, even though he was supposed to be nearby at the start of the ambush… Some heads needed to be bashed back to their proper place…which was under Ezza’s foot! As dust settled, Gromtig Copperbeard looked to Befat, who was lying against the walls of the brewery recovering from a few injuries sustained during the battle, and nodded. A chest full of gems was quickly dropped at the Ogre’s feet and what was left of the Dwarf throng walked inside the building to celebrate their victory and mourn their dead. Soon enough, the throng would be marching to Karak Norn to settle their first order of business. Temporary help would be offered to the human town if needed. Gromtig had already sent a messenger back to Zhufbar to report on the incident and ask for some “technical” help for the humans (Grungni knows how fragile and unsteady things built by manlings are…). Nice write up as always. Cheers for the pictures and the battle report. How're you finding 9th age so far? Cheers Chris, they've done a very good job on it. Just what it needed. Amazing looking game, Mark. Really cool to see all those gamers' Fantasy models battling it out at once.